We want to sincerely thank everyone who helped out a little bit extra last month to help us pay our bills. We pray that each of you is greatly rewarded for your generosity. As you will see on page 4, we have a sudden need for emergency repairs to our tower. Beyond that, we are working on village translators, and hoping for other major improvements, too. Thank you especially for your prayers. Our mission is fortunate to have such good friends. I’M FINISHED! (left) March 16th, KNOM news director Paul Korchin captures the cheers of the crowd a few seconds after Norwegian Robert S�rlie won the Iditarod Race for the second time. At right, a race official holds the flag of Norway at the Front Street finish line. The small box under Paul’s left arm is a transmitter that sends the signal a quarter-mile to the KNOM studio for broadcast live over the air. After 1,000 miles of trail, Iditarod mushers trickle into Nome around the clock for several days, and the KNOM staff cover every finish live. S�rlie’s victory came less than a day after Paul returned home, having covered the race by small airplane. Over the course of two weeks, he sent the station an incredible 147 interviews. The Iditarod Race generates huge interest in our area, as you can imagine, and attracts an immense audience, who also hear our news and informational programming, and educational and inspirational spots. IN PRINT: Did you see it? “Radio station makes a KNOM for itself,” read the headline in the March 6th edition of Our Sunday Visitor. The article was a sidebar to a larger piece discussing missionary work in Alaska, featuring KNOM spiritual director Fr. Mark Hoelsken, SJ. INSPIRATIONAL SPOT: Love is silence when words would hurt. ALOHA (left): Was that KNOM volunteer Anna Dummer circling Oahu in a National Guard C-130? It sure was, as Anna represented KNOM during an Employee Support of the Guard and Reserve trip to Hawaii. Anna was one of 36 Alaskans on the brief trip, organized to show employers of Guard members and Reservists the importance of their jobs and the training they are given. 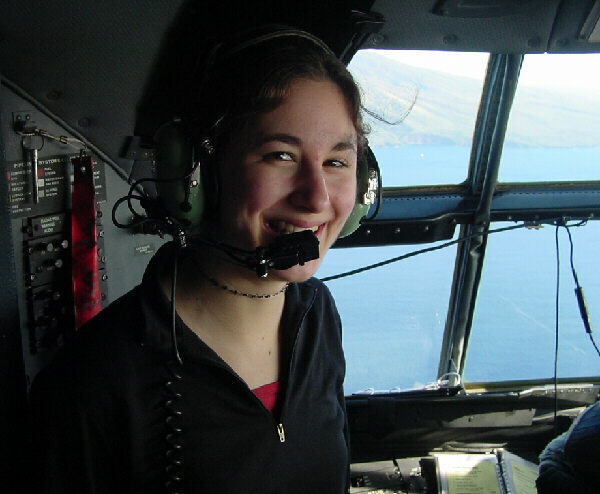 There was no first class for Anna, whose journey from Alaska was aboard a KC-135 tanker. She toured the civil defense site at Diamondhead, visited Pearl Harbor and the U.S. Pacific Command Headquarters, and met with Alaskan soldiers who were training prior to deployment in Afghanistan as journalists and photographers. Not surprisingly, Anna was the first KNOM’er in the station’s history to be dispatched to Hawaii on work duty! There was no cost to KNOM. Please consider adding KNOM to your will. For most of us, a bequest is the largest gift we will ever give. We prayerfully add all bequests to funds that are dedicated to future emergencies and major improvements. You know the story of Saint George the Dragon Slayer. He’s the knight in shining armor who rides into a North African town and hears about a fire-breathing dragon that demands the locals regularly send him a human sacrifice. They are. He does. There’s a big celebration. George and the princess live happily ever after. It’s a great story � but it’s not true. That version of the tale was written a thousand years after the real Saint George died a martyr to the Roman persecutions in Palestine around the year 300. Nothing else is known of George’s life. Nevertheless, George is patron saint of the Boy Scouts, Germany, Portugal and England, and his symbol of a red cross on a white background even became part of England’s flag. His feast day is April 23rd. INSPIRATIONAL SPOT: The way we treat others, perhaps more than anything else, is the measure of our union with God and our continuous practice of living prayer. 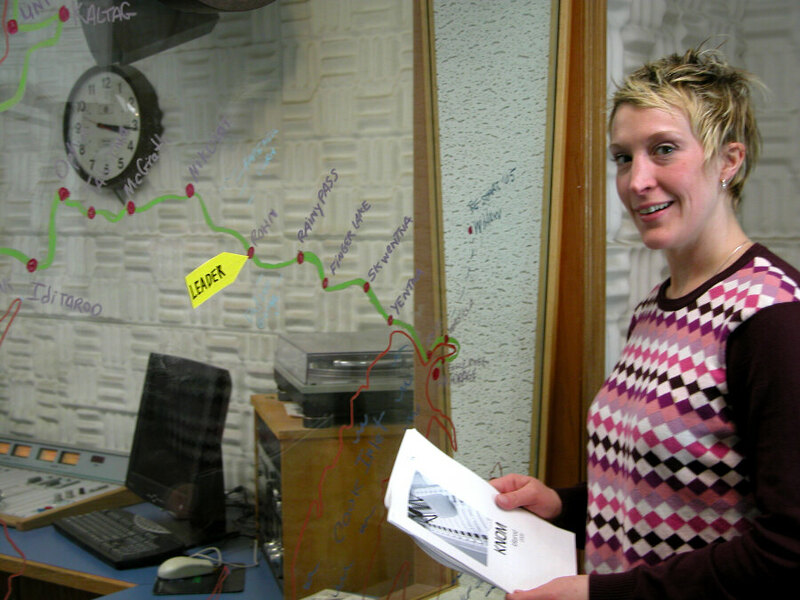 GLASS ACT (left): KNOM program director Kelly Brabec maintained a grease pencil map of the Iditarod Race on the window between Studios A and B. Before Iditarod’s first race in 1973, March was known as “suicide month” in western Alaska. We aim for exciting coverage that together with our inspirational programming, lifts spirits. A WORKING VACATION: 1993-98 news director Tom Bunger is a computer expert who lives in Anchorage. In March, Tom flew to Nome on vacation to pitch in at the station during the intense Iditarod finish week. Tom’s first newscast sparked enthusiastic applause from throughout the studio building. PUT TO GOOD USE: Last autumn, KNOM public affairs director Amy Flaherty interviewed an elderly woman in the village of St. Michael. When Amy returned to Nome, she was dismayed to discover that distracting background sounds made most of the interview unusable. She was, however, able to salvage enough audio for a brief educational spot. The elder, who had been taking care of her wheelchair-bound husband, died in early November. The interview eventually did find good use. Last month, the woman’s son asked for a copy of the tape, and Amy sent him one, so that his ailing dad can listen to his wife’s voice once again. CRYSTAL CLEAR: We’ve learned that KNOM is among fifty radio stations nominated for the National Association of Broadcasters’ Crystal Award for Excellence in Local Achievement. There will be ten recipients on April 19th. We have our fingers crossed! HIGH POWER: We are looking into increasing our daytime power to 50,000 Watts. It’s something that’s been in the back of our minds for many years. It’s legally possible. Our 8-year-old transmitter building was designed to accommodate a 50,000-Watt transmitter, which would greatly improve our signal in many villages. The cost for the additional electricity would increase our budget by about 5%, however, so we need to proceed carefully. INSPIRATIONAL SPOT: In times of struggle and sorrow, remember that God knows best. He always has His reasons. BEWARE THE ICE OF MARCH: (left) A broken unipole wire dangles from the 140-foot level of the KNOM tower. Everything is coated with a half-inch of ice. The wire is one of six that surrounds the tower, held off by three foot insulators, which are visible toward the top and bottom of this photo. March 15th, strong winds loosened one of these insulators and pushed it sideways. The unipole wire it was holding then brushed against a guy cable 160 feet above ground, and due to its high voltage, burned through. This greatly changed the antenna’s characteristics, forcing us to about half our normal power. When the wind blows and the wire snaps against the tower, we need to reduce power to as low as 2,000 Watts just to stay on the air. As this issue went to press, we were trying to locate a tower crew that could fly to Nome and repair the problem. At a time when we are just barely making ends meet, this may represent an emergency expense of $5,000 to $10,000. Ouch! TRANSLATING: We are planning to install the first KNOM translators (low-power transmitters) in the villages of Shishmaref, Kaltag, Nulato, Ruby and St. Marys. The target date for these first five is July 15th. We will feed KNOM’s signal to these little units by AT&T satellite. Eventually, when all thirteen translators are up and running, they will increase KNOM’s daily listenership by about 50%. THIRTY YEARS AGO: The middle of April 1975 brought Nome the worst blizzard of the winter, shutting down virtually everything in western Alaska � except KNOM � for a day. We close with another prayer of thanks for your kind help. Each week, we open our staff meeting with a prayer for all of our mission’s benefactors, and you remain in our individual daily prayers, too. It takes hard work and sacrifices by many, many good people to keep this, the country’s oldest Catholic radio station, alive and strong. Please stay with us through the challenges that lie ahead, won’t you? Thank you once again. May Our Lord bless you greatly.